An administrative executive is responsible for the administrative activities of the organization. The roles and responsibilities mentioned in the job description template are juggling phone calls, handling mails and guiding with administrative advice. The duties highlighted in the Administrative Executive Resume are maintaining the confidentiality of the information shared, preparing materials for meetings and properly documenting whatever is happening in the meetings and scheduling daily routine. There are other responsibilities like maintaining all official records, handling the inventory and travel arrangements and supervising the minor activities. The key skills required are communication skills, proficiency with computers, a positive and patient approach and good command over the English language. The individual should also have good organizational and problem-solving skills and have good time management skills. The educational qualification required is the bachelor’s degree or equivalent. Experience in the relevant field is a plus. 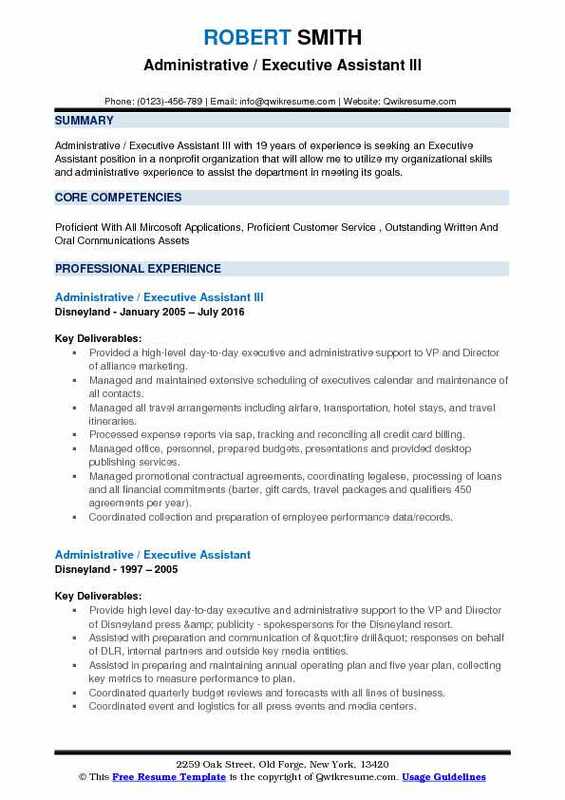 Headline : Dedicated Executive Administrative Assistant with 5 years of proven experience supporting senior level executives and management teams. Meets deadlines and works with a high level of professionalism, adaptability, and confidentiality. Overseeing the work of clerical and other administrative employees, as well as making sure that everything is in place for the office to function smoothly. Demonstrating the flexibility while providing executive and administrative support for corporate clients in diverse industries. Creating and updating multiple databases and spreadsheets, and editing reports. Providing executive support to the CEO and Partner, including organizing both their calendars and schedules. Tracking and coordinating all interviews for psychometrist positions. Handling sensitive telephone calls and documents. Responsible for managing office inventory and ordering office supplies as necessary. Responsible for onboarding of new hires with training and company policies and procedures. Creating a filing and numbering system which helped the company with better organization. Relevant knowledge of computer software, Excel, Microsoft Word, QuickBooks, Google Docs. Managing all the scheduling by setting up meetings, and making appointments. Exercising discretion and all Hipaa regulations by maintaining a high level of confidentiality. 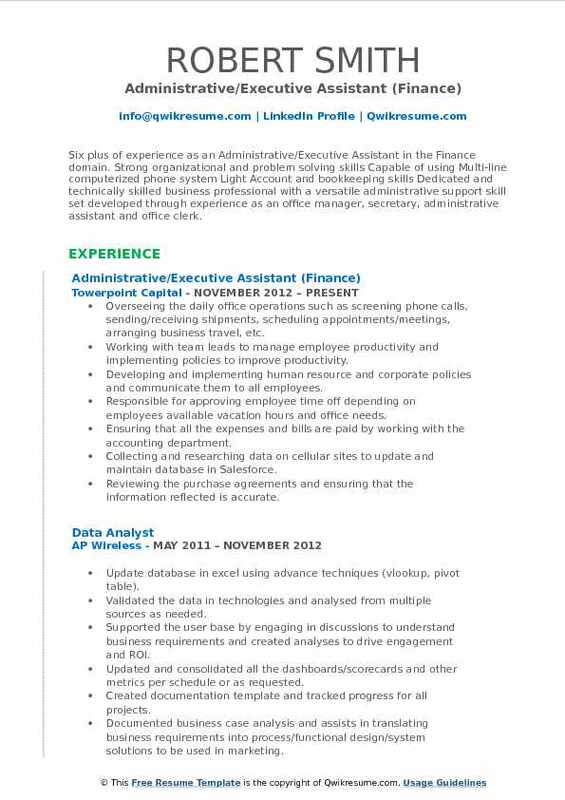 Objective : Administrative/Executive Assistant with over 4 years experience in the Technology domain. A dynamic, motivated self-starter, detail oriented and an ambitious team player with a track record of consistently meeting goals and delivering high level of job performance. Shown proven ability to build strong customer/client relationships. Personable and professional under pressure. Outgoing personality and unlimited customer service skills. Well organized with ability to rapidly learn new tasks. Supported the Senior Vice President of business development, as well as seven executives, and multiple contractors with the full range of office management and administrative duties. Received visitors and represented the company in a professional and friendly manner to all external and internal contacts. 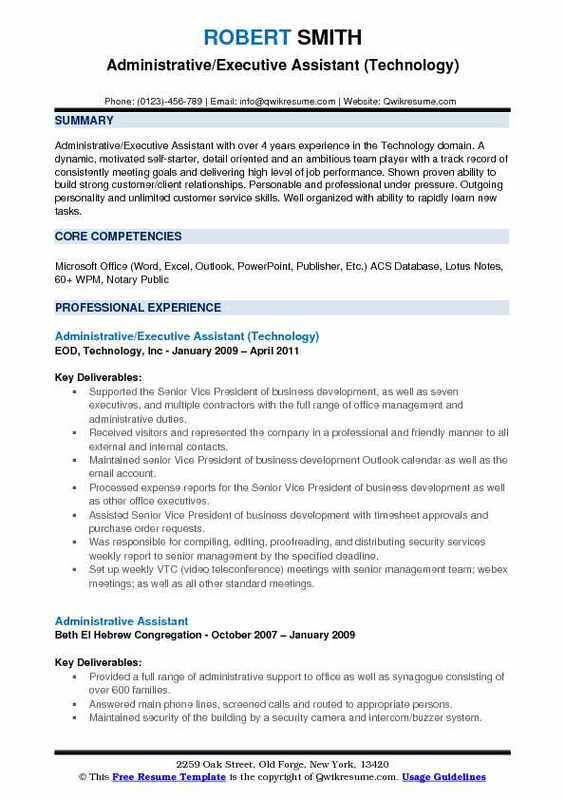 Maintained senior Vice President of business development Outlook calendar as well as the email account. Processed expense reports for the Senior Vice President of business development as well as other office executives. Assisted Senior Vice President of business development with timesheet approvals and purchase order requests. Was responsible for compiling, editing, proofreading, and distributing security services weekly report to senior management by the specified deadline. Set up weekly VTC (video teleconference) meetings with senior management team; webex meetings; as well as all other standard meetings. Acted as liaison with property management, maintenance, and company headquarters. Assisted with the maintenance of office server backups/issues and computer and/or phone troubleshooting, with the guidance of offsite IT team. Managed office supply inventory, corporate parking account for the entire office, office rentals, furniture purchasing, etc. Assisted with powerpoint presentations, Excel sheet and Word documents as needed. Summary : Friendly, adaptable professional with versatile experience of 10 years as an Administrative and Executive Assistant is able to serve on a team as a leader or member. Focused and self-driven when given independent work. Creates and maintain the personnel records to include yearly reviews and resumes. Locked information until access needed. Read and analyzes incoming memos, email, and reports for department Vice President and Directors. Responded and distributed as necessary. Scheduled training modules for the training department. Informed the employees when they are scheduled for training. Assembled the training materials. Updated employee records upon completion of training modules. Travel arrangement (the USA and International) booked the flight, hotel and rental car. Maintained the passport files. Ensured corporate credit cards are current. Prepared expense reports on a timely basis. Coordinated local and USA conferences/meetings. Researched and booked facilities. Arranged setup of meeting rooms and equipment. Ordered meals and break-time refreshments. Arranged the evening entertainment and activities. Blocked necessary hotel rooms for travelers. Took minutes for management and attendee distribution. Ordered and dispensed supplies from basic everyday items to employee-assigned laptops and cell phones. Maintained supply database. 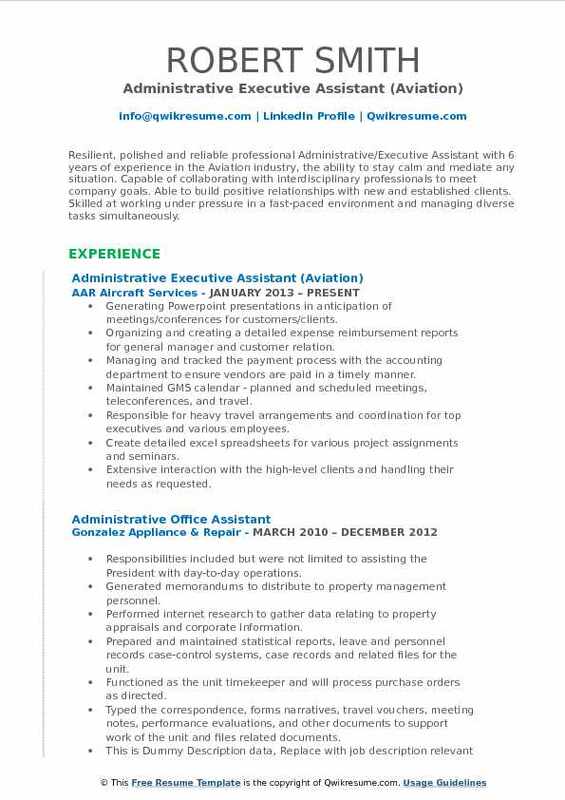 Headline : Resilient, polished and reliable professional Administrative/Executive Assistant with 6 years of experience in the Aviation industry, the ability to stay calm and mediate any situation. Capable of collaborating with interdisciplinary professionals to meet company goals. Able to build positive relationships with new and established clients. Skilled at working under pressure in a fast-paced environment and managing diverse tasks simultaneously. Generating Powerpoint presentations in anticipation of meetings/conferences for customers/clients. Organizing and creating a detailed expense reimbursement reports for general manager and customer relation. Managing and tracked the payment process with the accounting department to ensure vendors are paid in a timely manner. Maintained GMS calendar - planned and scheduled meetings, teleconferences, and travel. Responsible for heavy travel arrangements and coordination for top executives and various employees. Create detailed excel spreadsheets for various project assignments and seminars. Extensive interaction with the high-level clients and handling their needs as requested. Managing the inventory office supplies foMiamimi and Duluth headquarters. Preparing invoices, reports, memos, letters, financial statements, and other documents, using Word processing, Spreadsheet, Database or Presentation software. 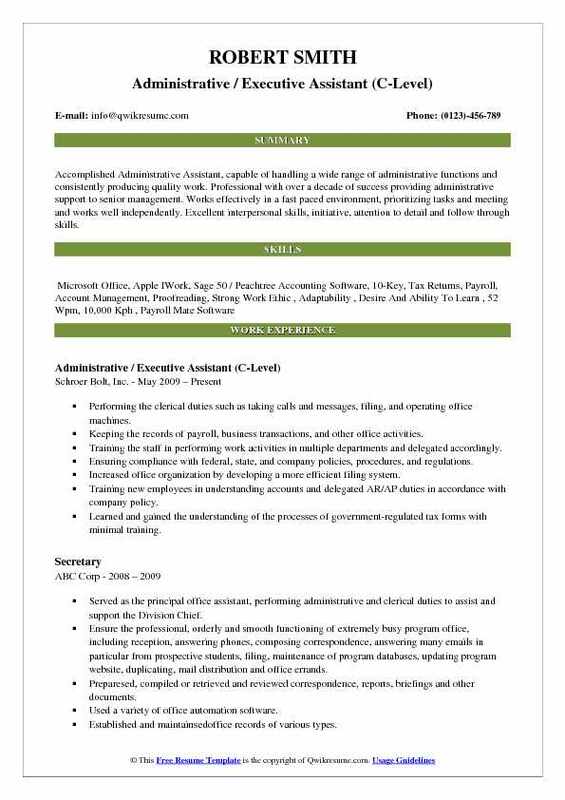 Objective : An accomplished Administrative Executive Assistant with a track record of providing and delivering outstanding administrative support and results to diversified industries. Skills : Microsoft Office (Word, Excel, Powerpoint, Access And Outlook), Oracle, Integrate UPS Worldship, UPS IShip, CRM Softwares. Arranged travel and accommodations for staff, prepared travel orders, memos, travel vouchers and support documentation for approval and fund disbursement. Interfaced with travelers and ensure appropriate travel policies and procedures. Performed a variety of secretarial and administrative duties for assigned staff. Met with assigned staff on a daily basis to review calendar and provide updates. Managed the calendar of assigned staff by responding to meeting invites and inquiries, noting dates and times of important events and rescheduling meetings as needed. Provided planning and scheduling of meetings with call center manager, team, and the director. Handled incoming telephone calls for assigned staff for the main extension for the division during normal business hours and ensured that inquiries are answered tactfully, pleasantly and intelligently based on knowledge of program operations. Handled all incoming interviews for the call center, scheduled them in the calendar and met them in the security office and bringing them to proper locations for an interview with the appropriate staff member. Strong secretarial skills, demonstrated knowledge of correspondence preparation, proofreading, spelling and grammar correction. Kept confidentiality of all staff and incoming calls dealing with private accounts from providers of Medicaid. 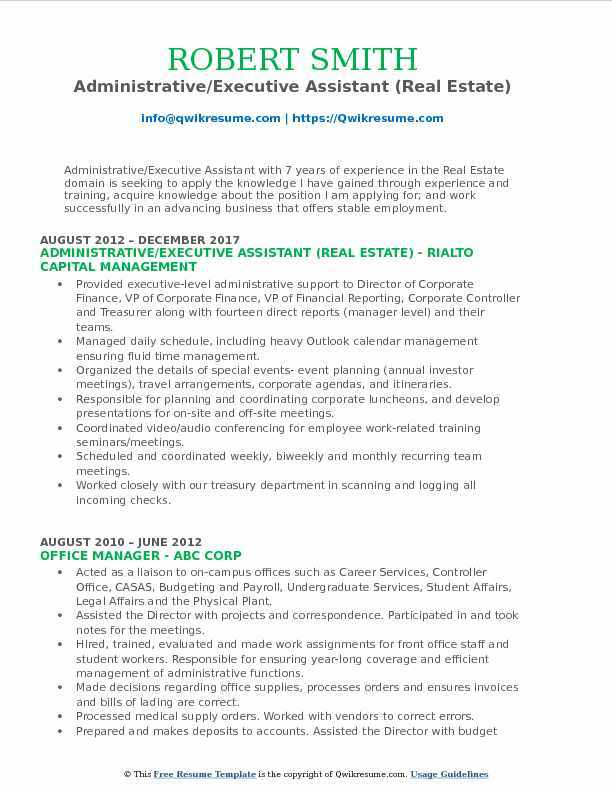 Headline : A highly self-motivated Administrative/Executive Assistant with 6 years of experience in the Restaurant and Food services domain, committed to achieving organizational objectives. Able to work under pressure, organized, energetic, hard worker, and detail oriented. Seeking a position, where my extensive experience will be further developed and utilized, as a team player in a people-oriented organization, and in a challenging environment to achieve the corporate goals. Scheduled and coordinated meetings and appointments for supervisors and managers. Provided direct support to the President, Vice President, Sales team, and Operations. Developed new filing and organizational practices, saving our company money in contracted labor expenses. Directly corresponded with the insurance agencies to ensure a valid certificate of insurance is on file. Maintained office supply inventories while carefully adhering to company budgeting practices. Trained multiple members of our operations team on the new multi-phone system. Greeted visitors and determine whom and when they could speak to certain individuals. Carefully managed Vice President and CEOs schedules to ensure no scheduling conflicts arise. Ensured that office equipment is running smoothly and arrange for equipment repairs and maintenance. Ensured that customers or visitors are entertained properly until they meet the appropriate person. 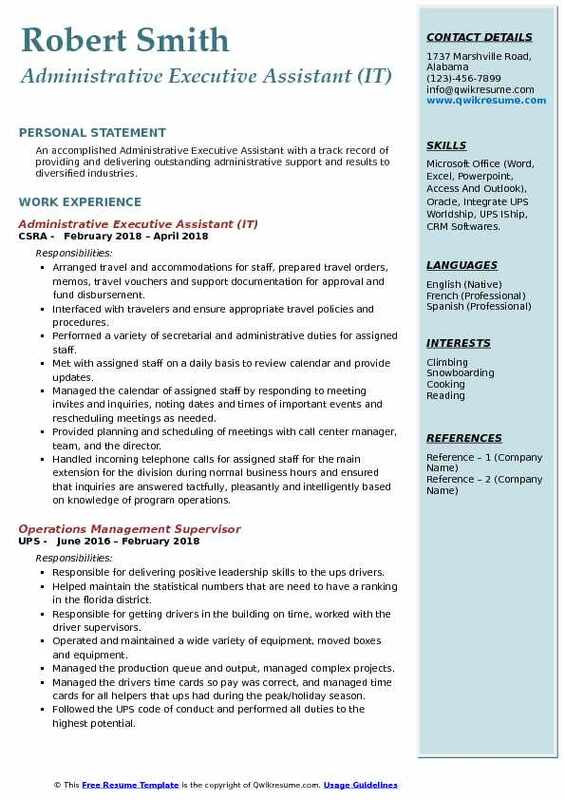 Headline : Administrative/Executive Assistant with 7 years of experience in the Real Estate domain is seeking to apply the knowledge I have gained through experience and training, acquire knowledge about the position I am applying for; and work successfully in an advancing business that offers stable employment. Provided executive-level administrative support to Director of Corporate Finance, VP of Corporate Finance, VP of Financial Reporting, Corporate Controller and Treasurer along with fourteen direct reports (manager level) and their teams. Managed daily schedule, including heavy Outlook calendar management ensuring fluid time management. Organized the details of special events- event planning (annual investor meetings), travel arrangements, corporate agendas, and itineraries. Responsible for planning and coordinating corporate luncheons, and develop presentations for on-site and off-site meetings. Coordinated video/audio conferencing for employee work-related training seminars/meetings. Scheduled and coordinated weekly, biweekly and monthly recurring team meetings. Worked closely with our treasury department in scanning and logging all incoming checks. Created powerpoint presentations and charts for senior-level meetings. Responsible for handling subscription for all CPE licensing for CPA associates. Summary : Dedicated and focused Administrative/Executive Assistant with 17 plus years of experience in the Automobile industry, who excels in prioritizing, completing multiple tasks simultaneously and following through to achieve project goals. Flexible and hardworking with a strong drive to succeed. Coordinator of the firm-wide external records management system (several thousand records) and calculated and ensured that monthly invoices from the vendor were correct. Managed entry, exit and transfer of GM employees in a computerized system for the organization. Granted IT access to computer applications and programs to GM staff using SharePoint. Scheduled meetings for three department heads and their staff, coordinated travel, and facilitated conference registrations. Coordinated meetings with seven committees and set up conference calls (weekly, monthly, bi-annually) IT steering committee, Risk management committee, IT/Finance committee, Valuation committee, etc. Entered time sheets for financial analysts and IT personnel in the General Motors timekeeping system on a bi-monthly basis. Created and revised financial and legal documents, presentations and spreadsheets. Backed up the administrator to the legal and compliance departments when administrators were on vacation or away from their desks. Ordered office supplies for above departments and general office supplies for the firm. Summary : Administrative/ Executive Assistant with 25 plus years of combined experience in the Healthcare and the Educational domains. 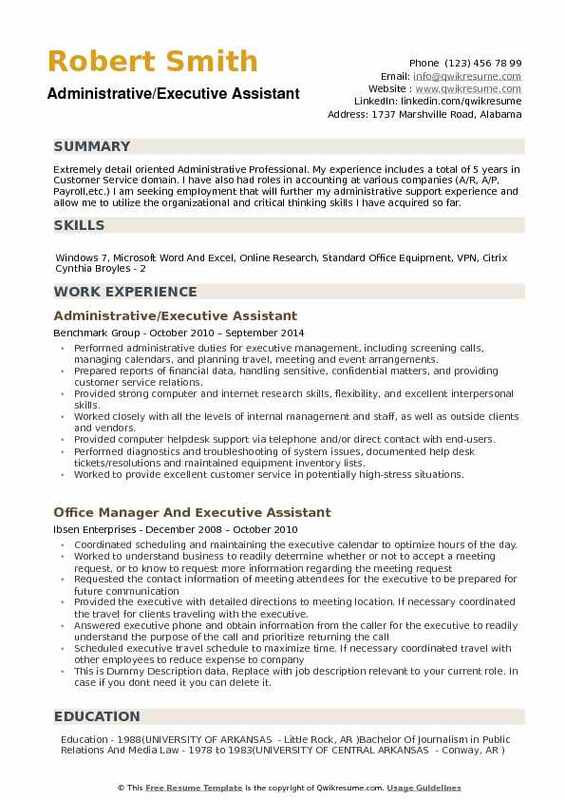 Seeking an Administrative Assistant position that will provide my employer with professional services while utilizing my experience, honesty, and integrity. Assisting the CEO in routine matters and preserving the confidential nature of items. Receiving visitors, answers phone, and scheduling appointments for the CEO. Keeping files of all correspondences and necessary reports, and maintaining contracts. Sending monthly financial reports and other reports to department heads. Communicating with physicians and other healthcare professionals to clarify diagnoses or to obtain additional information. Preparing patient charts, admissions, and consent forms accurately and neatly for continuing care. Receiving and distributing mail to appropriate departments responsible for outgoing mail. Attending medical staff, hospital authority board, and department meetings and recording the minutes. Completing hospital property, auto, workman comp, and D&O insurance renewal applications. Preparing for Joint Commission Survey and participated in the survey process. Prepared and revised approved medical staff bylaws and rules and regulations. Headline : Extremely detail oriented Administrative Professional. My experience includes a total of 5 years in Customer Service domain. 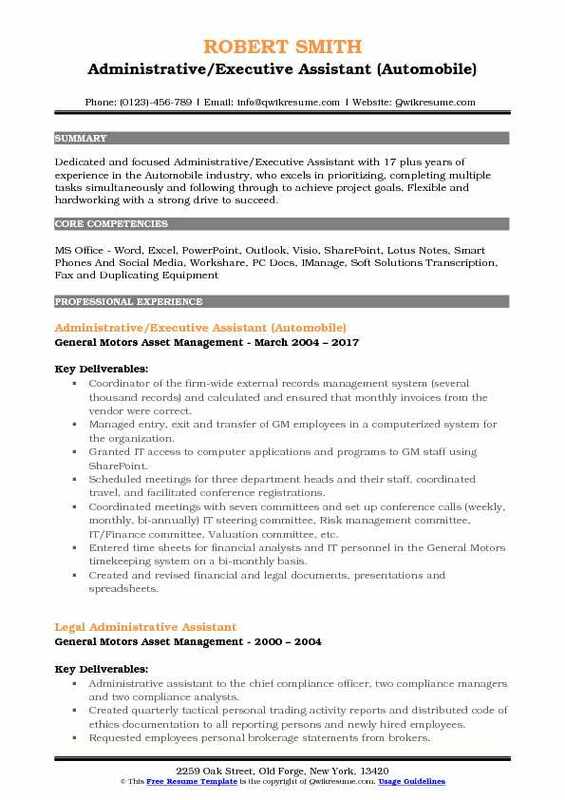 I have also had roles in accounting at various companies (A/R, A/P, Payroll,etc.) 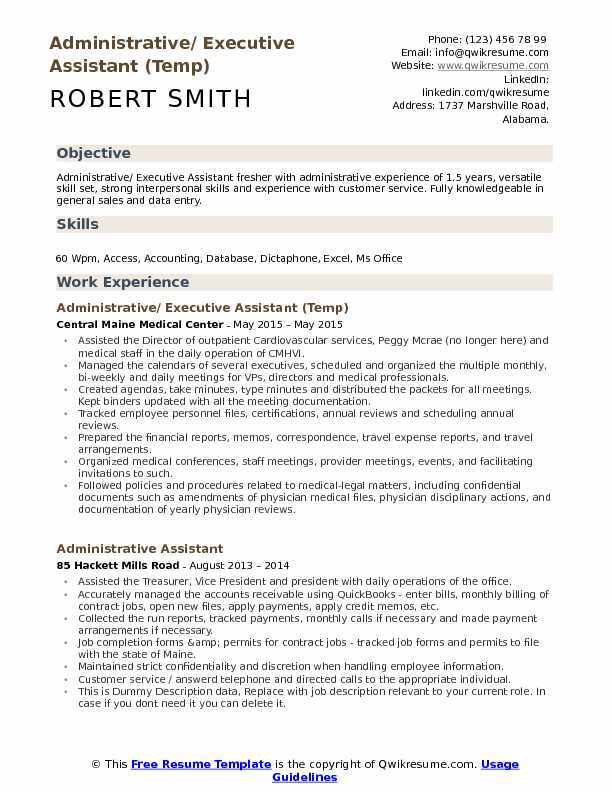 I am seeking employment that will further my administrative support experience and allow me to utilize the organizational and critical thinking skills I have acquired so far. Performed administrative duties for executive management, including screening calls, managing calendars, and planning travel, meeting and event arrangements. 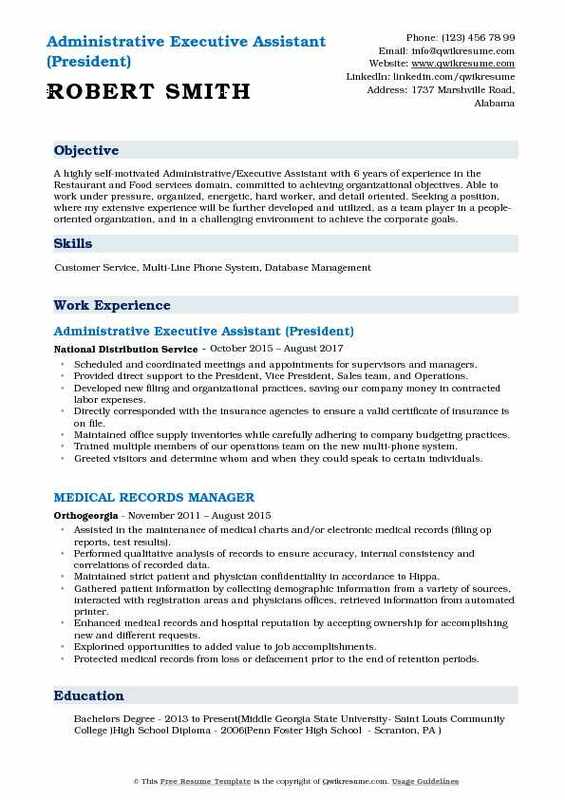 Prepared reports of financial data, handling sensitive, confidential matters, and providing customer service relations. Provided strong computer and internet research skills, flexibility, and excellent interpersonal skills. Worked closely with all the levels of internal management and staff, as well as outside clients and vendors. Provided computer helpdesk support via telephone and/or direct contact with end-users. Performed diagnostics and troubleshooting of system issues, documented help desk tickets/resolutions and maintained equipment inventory lists. Worked to provide excellent customer service in potentially high-stress situations. Interacted with staff members diplomatically and gauged their knowledge of computers and technology in order to support their technological issues. 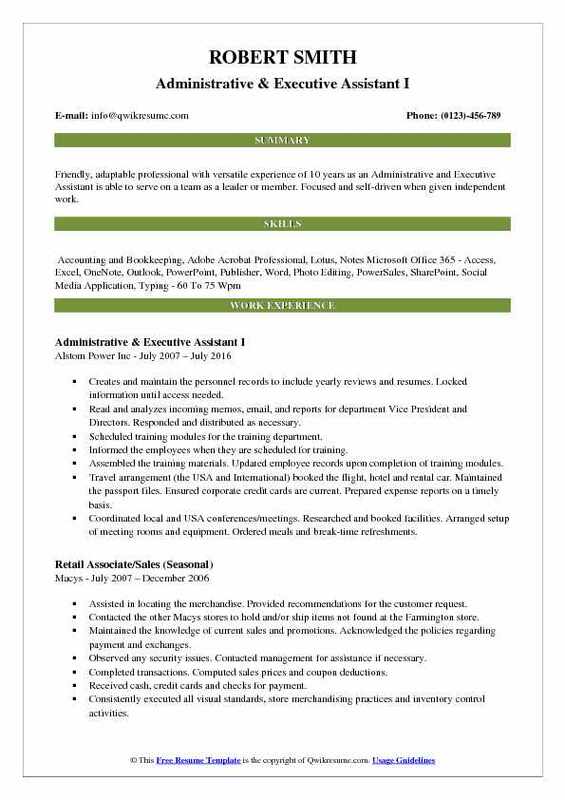 Objective : Administrative/ Executive Assistant fresher with administrative experience of 1.5 years, versatile skill set, strong interpersonal skills and experience with customer service. Fully knowledgeable in general sales and data entry. Assisted the Director of outpatient Cardiovascular services, Peggy Mcrae (no longer here) and medical staff in the daily operation of CMHVI. Managed the calendars of several executives, scheduled and organized the multiple monthly, bi-weekly and daily meetings for VPs, directors and medical professionals. Created agendas, take minutes, type minutes and distributed the packets for all meetings. Kept binders updated with all the meeting documentation. Tracked employee personnel files, certifications, annual reviews and scheduling annual reviews. Prepared the financial reports, memos, correspondence, travel expense reports, and travel arrangements. Organized medical conferences, staff meetings, provider meetings, events, and facilitating invitations to such. Followed policies and procedures related to medical-legal matters, including confidential documents such as amendments of physician medical files, physician disciplinary actions, and documentation of yearly physician reviews. 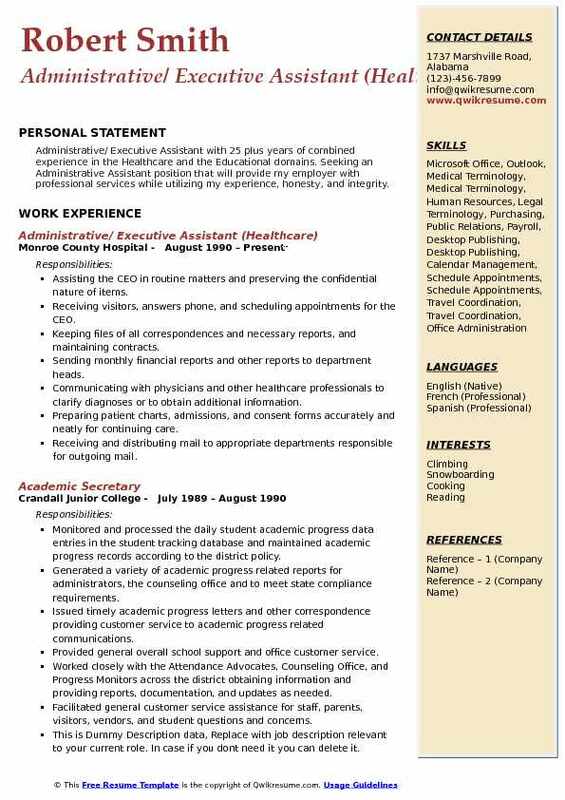 Summary : Administrative / Executive Assistant III with 19 years of experience is seeking an Executive Assistant position in a nonprofit organization that will allow me to utilize my organizational skills and administrative experience to assist the department in meeting its goals. 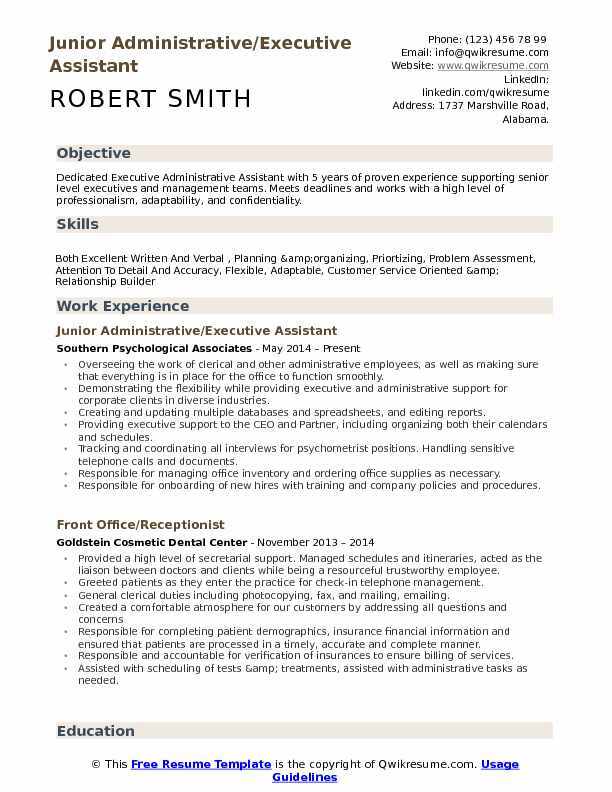 Provided a high-level day-to-day executive and administrative support to VP and Director of alliance marketing. Managed and maintained extensive scheduling of executives calendar and maintenance of all contacts. Managed all travel arrangements including airfare, transportation, hotel stays, and travel itineraries. Processed expense reports via sap, tracking and reconciling all credit card billing. Managed office, personnel, prepared budgets, presentations and provided desktop publishing services. Managed promotional contractual agreements, coordinating legalese, processing of loans and all financial commitments (barter, gift cards, travel packages and qualifiers 450 agreements per year). Coordinated collection and preparation of employee performance data/records. Reviewed and streamlined operating processes and systems, office layout and planning. Retrieved and faxed documents as necessary to customers and/or suppliers. Proofread the work done by others to ensure that company policies are followed. Summary : Accomplished Administrative Assistant, capable of handling a wide range of administrative functions and consistently producing quality work. Professional with over a decade of success providing administrative support to senior management. Works effectively in a fast paced environment, prioritizing tasks and meeting and works well independently. Excellent interpersonal skills, initiative, attention to detail and follow through skills. Performing the clerical duties such as taking calls and messages, filing, and operating office machines. Keeping the records of payroll, business transactions, and other office activities. Training the staff in performing work activities in multiple departments and delegated accordingly. Ensuring compliance with federal, state, and company policies, procedures, and regulations. Increased office organization by developing a more efficient filing system. Training new employees in understanding accounts and delegated AR/AP duties in accordance with company policy. Learned and gained the understanding of the processes of government-regulated tax forms with minimal training. Handling all the expense reports for Executives. Processing invoices. Coordinating and/or editing of presentations, processing various VIP requests. Headline : Six plus of experience as an Administrative/Executive Assistant in the Finance domain. 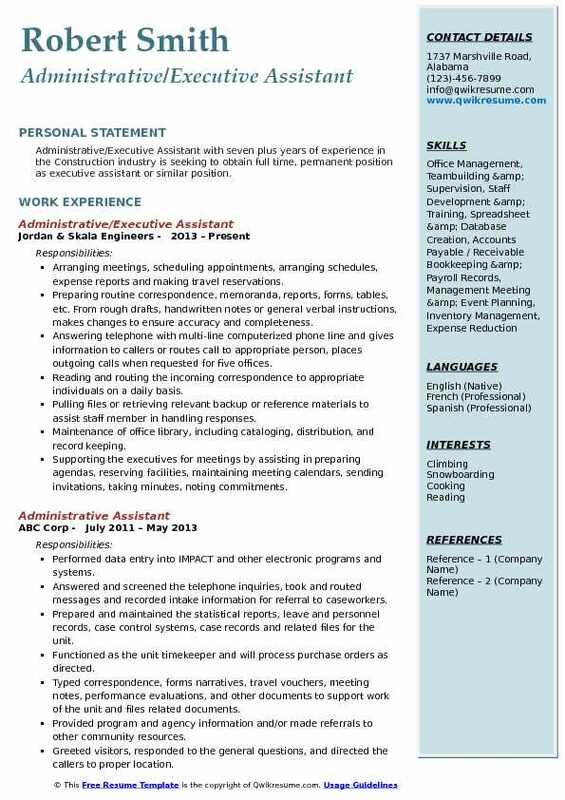 Strong organizational and problem solving skills Capable of using Multi-line computerized phone system Light Account and bookkeeping skills Dedicated and technically skilled business professional with a versatile administrative support skill set developed through experience as an office manager, secretary, administrative assistant and office clerk. Overseeing the daily office operations such as screening phone calls, sending/receiving shipments, scheduling appointments/meetings, arranging business travel, etc. Working with team leads to manage employee productivity and implementing policies to improve productivity. Developing and implementing human resource and corporate policies and communicate them to all employees. Responsible for approving employee time off depending on employees available vacation hours and office needs. Ensuring that all the expenses and bills are paid by working with the accounting department. Collecting and researching data on cellular sites to update and maintain database in Salesforce. Reviewing the purchase agreements and ensuring that the information reflected is accurate. Helping with due diligence by carefully reviewing lease contracts and collecting information needed for the underwriting process. Summary : Administrative/Executive Assistant with seven plus years of experience in the Construction industry is seeking to obtain full time, permanent position as executive assistant or similar position. Arranging meetings, scheduling appointments, arranging schedules, expense reports and making travel reservations. Preparing routine correspondence, memoranda, reports, forms, tables, etc. From rough drafts, handwritten notes or general verbal instructions, makes changes to ensure accuracy and completeness. Answering telephone with multi-line computerized phone line and gives information to callers or routes call to appropriate person, places outgoing calls when requested for five offices. Reading and routing the incoming correspondence to appropriate individuals on a daily basis. Pulling files or retrieving relevant backup or reference materials to assist staff member in handling responses. Maintenance of office library, including cataloging, distribution, and record keeping. Supporting the executives for meetings by assisting in preparing agendas, reserving facilities, maintaining meeting calendars, sending invitations, taking minutes, noting commitments. Performing filing, data management, drafting and editing short office memos.